SIOUX CITY, Iowa -- So much for the old adage, "father knows best." In the case of Chicago Steel prospects Jake Chelios and Alex Krushelnyski, some things are better left unsaid. For instance, why does Chelios prefer to play forward instead of defense, the position his father, Chris, laid claim to fame for 25 NHL seasons? "It's pretty simple," Jake, 18, told NHL.com. "Me and my brother wanted to score goals, that's about it." Krushelnyski, who turns 19 in November, admits he plays nothing like his old man. Mike Krushelnyski played 14 NHL seasons with five different teams. He won four Stanley Cups -- three as a player in Edmonton and one as an assistant coach in Detroit. "I'd say I'm a little more of a finesse guy than dad was," Krushelnyski said. "At least he'd like me to be. It's funny really -- my style of play is totally opposite from the feisty style he played." So there you have it. Two varying opinions from players who could simply follow in dad's footsteps and never be questioned. Then again, why play follow the leader when you're old enough to start from scratch and take on a new identity? Chelios won a pair of USA National Hockey Championships with the Little Caesars AAA Hockey League in 2004 and 2008 and is now following in the footsteps of his older brother, Dean, who played two seasons with the USHL's Steel before being recruited by Michigan State this past spring. Sioux City, Iowa, is becoming a mecca for scouts and fans thanks to the USHL Fall Classic. BLOG: Sioux City: "Fall Classic Files"
"Dean helps out a lot," Chelios said. "I call him every day when there's a problem because he has the answers. He went through the same problems as me starting out as a rookie and not playing that much, but developed and had a great second year so he's been the biggest influence on me right now." While playing time has been hard to come by in Jake's first season with Chicago, it certainly doesn't show in the way he carries himself in and around the rink these days. "One thing my father always tells me is to just work hard no matter what," he said. "He doesn't put all that emphasis on skill or anything like that. Right now, I'm at the bottom of the lineup, but I'm fine with that. I'm not going to complain about it and I know that as long as I keep working through it, things are going to pan out in the end." That's the approach Chicago coach Steve Poapst wants to hear. "He's grown over the summer and has gotten bigger," Poapst said. "He has the skill and ability and a little more grit and drive than his older brother. Dean possessed tremendous skill and ability and a knack to protect the puck. Jake has some of those similar qualities with a little more jam to his game." Chelios (6-foot-1, 180 pounds) is making a concerted effort to add some weight in order to withstand the grind of a full season. "Until two years ago, I was 5-4 and 100 pounds, and was still trying to play a big man's game, but that didn't work out too well," he said. "But finally I grew and now I'm 6-1, but I still don't have enough weight on me. So I'm just trying to keep some weight on and work out as often as I can." Krushelnyski, on the other hand, appears to have found his groove in his second season in the USHL with the Steel. He receives a regular shift and plays a pivotal role on specialty teams. He feels having that season of experience under his belt has provided some confidence entering the 2009-10 campaign. 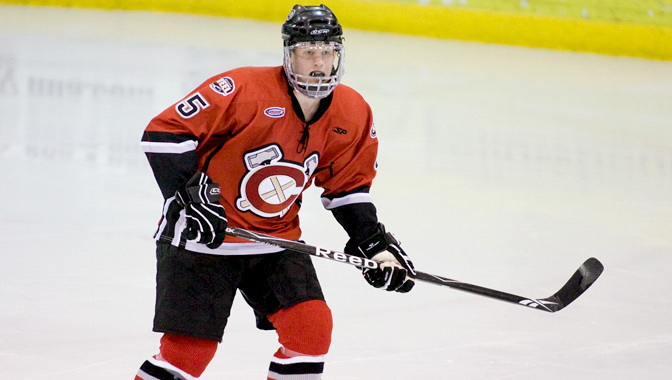 The 5-foot-11, 172 pound wing notched 7 goals and 18 points in 38 games with the Steel in 2008-09. "Last year was a learning curve for me because I started off so-so and then got hurt for about half the season," he said. "But I came back and in my final 10 games I was having a great season -- I didn't want it to end. But I'm really hoping to just carry that over this year." And the one thing Krushelnyski learned from dad? "To shoot the puck," he admitted. "It's all about percentages. If you shoot five times, one is bound to go in. That's one thing I've been trying to do, in addition to keeping my feet moving. I'm a better player when I move my feet." The Steel open the 2009-10 season on Oct. 3 against the U.S. National Team Developmental Program Under-17 team at The Edge Ice Arena in Bensenville, Illinois.